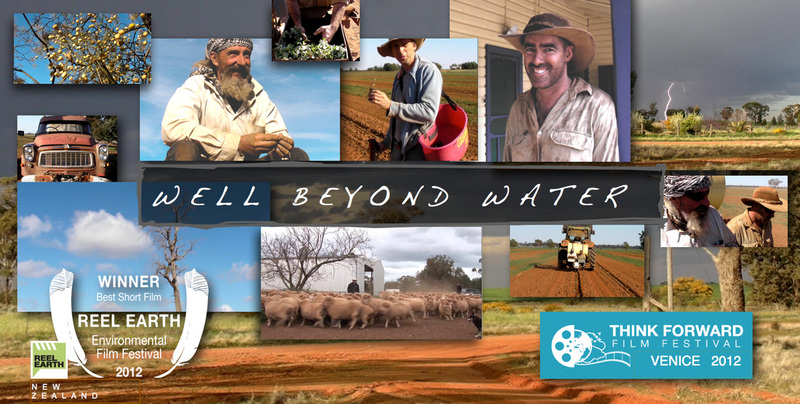 WELL BEYOND WATER is a personal short form documentary (27mins) made by English composer musician and novice film maker Andy Ross who finds himself immersed into the unlikely world of Australian sheep farmers who are dealing with a prolonged and difficult drought. Contrary to his expectations he discovers an inspiring farmer who is finding ways to adapt to the challenges of a changing climate. The farmer raises questions about the meaning of drought and points to a need for cultural change and adaptive strategies in farming practice. 'Well Beyond Water' is a highly personal documentary that records English composer, Andy Ross’s, immersion in the sheep farming community of a remote part of New South Wales, Australia. Just about the last place he expected to be. Recently arrived from England, Andy was commissioned by Australian arts organisation, Big hART, to compose a piece of music that might articulate the Australian farmers’ experience of the prolonged drought. Keen to know more Andy lived and worked on a sheep farm owned by Graham Strong whose efforts to rise to the challenges of climate change are at the heart of this film. With no filming experience and no documentary in mind Andy kept a personal video diary of his time on the farm using a small £300 camera. A video diary that over time became this documentary. 'Well Beyond Water' explores the issues that Graham is dealing with every day through a dialogue between musician and farmer, a Brit and an Aussie, an outsider and an insider.For Andy it’s a voyage of discovery; for Graham it’s the opportunity to get his views heard. A man of strong convictions, Graham’s philosophy is one of respect for the land. Rather than grazing his sheep on a dwindling supply of drought savaged grass which is common practise in the area, he had chosen to take a more adaptive approach and is now feeding his sheep on an indigenous plant—salt bush—which is hardy enough to survive in dry conditions. Andy found himself inspired by Graham’s indomitable spirit and captivated by his views.To his surprise, he and Graham had far more in common than he had ever imagined. Coming from two such totally different worlds, they share a commitment to creative problem solving and a determination to thrive on change.